TAKE A JOURNEY in this book to a land that is both stunning and subtle, back to the places where tales of magic were born. In the Realm of the Gods is the first book to tell China's rich folk traditions and tales of the natural and supernatural in a unique way--by geographic region. The result is a Grand Tour through China. The stories of China's ancient capitals, its sacred mountains, rivers, trade routes, and caravans, lush gardens, and mysterious grottoes, all serve as the setting for a magical journey through all points on the compass. Here are the stories of kings, ghosts, spirits, warriors, scholars, and magical realms in a landscape potent with history. Accompanying the tales are stunning photographs taken by China's most acclaimed landscape photographers. Their studies of abandoned villas, vertiginous cliffs, night-time pathways and temples at dusk give us an unprecedented visual setting for the tales. In the Realm of the Gods shows us the eerie places and magical precincts where immortals, demons and gods have--for centuries--belonged. Here is a guidebook to once upon a time. "These irresistible tales have a freshness and charming vitality, admixed with ancient echoes. The sumptuous photographs perfectly complement these utterly engaging stories--altogether a delight!" "What a brilliant and completely fascinating book this is! Victoria Cass' fabulous retelling of the tales together with the gorgeous and evocative photographs she has chosen to accompany them deliver pure enchantment. This book is a treasure." 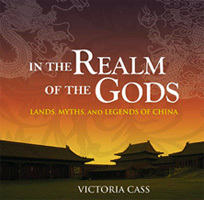 "Cass brings China's mythic landscape to life. These stories draw the reader into a quintessentially Chinese dimension that hovers over a magical landscap where ordinary mortals confront extraordinary powers. This is a journey into the psyche of eternal China." "This is a unique book, combining solid scholarship with a supple writing style.... It deserves a wide readership." "Cass has created a near perfect marriage of image and text in her delightful retelling of Chinese myths and folklore, situated in their places of origin.... A true pleasure to read."  Read the story, "Guan Yin"